Mice are singly housed and fasted 18 hr prior to intra-gastric dosing with acetaminophen. Gavaging is used to dose mice with a specified volume (10 mL/kg) of APAP directly into the stomach. Only specialized, commercially available gavage needles for mice are used. The syringe is first filled with the appropriate volume and material before the needle is attached. b. The tip or ball of the gavaging needle is placed into the mouse's mouth. c. The tip is then gently slid past the back of the tongue. d. The tip of the needle should slide easily down the esophagus, otherwise, the needle is improperly placed and should never be forced. Any resistance encountered required the removal of the needle and followed by reinsertion. e. Further injury to surrounding tissues is carefully avoided by holding the syringe and preventing it from aspirating. f. Only when the needle is properly in placed that a given dose of vehicle or APAP is administered via the attachment of the syringe. a. Mice that have been fasted for 18 hrs are weighed to determine the volume of vehicle and/or volume of prepared dose of APAP to be given at 10 mL/kg body weight. b. The treatment doses given are 30, 100, 200, 300, 600, 900, and 1200 mg APAP/kg body weight. c. Dosing is performed at the same time of the day throughout the study to avoid any diurnal effects. d. Feed is returned 3 h after dosing. e. Mice are sacrificed at 4 or 24 h post-APAP administration. Interim blood samples may be obtained by nicking the lateral tail veins (sufficient for the collection of small amount (<200 µL) of blood). This method is used with utmost caution, since improperly done may cause permanent tail injury or amputation. In contrast, blood collection via the vena cava is a terminal procedure and performed under general anesthesia using Nembutal at a dose of 100 mg/kg body weight. a. The mice are warmed under a heat source. With diligent care so as not to overheat them the temperature at their level is kept below 85 - 90° Fahrenheit (29.4 - 32.2°C). b. A mouse to be tail-bled is gently placed on a restrainer. c. The tail is disinfected with 70% ethanol and then stabilized with the thumb and forefinger of the hand that will not be used to nick the tail. d. Generally it is best to begin at least half way down the tail in case there is a problem, such that another nick above the initial site can be made to obtain adequate amount of blood sample. Using a new or sharp #11 scalpel blade, the lateral tail vein is gently nicked in the general area around the midline of the tail. e. The blood is allowed to freely flow into a pre-labeled empty (no anti-coagulant) Ependorf tube. Any attempt to squeeze the tail or to "milk" blood from the tail is avoided since damaged to tissues can contaminate the blood sample with tissue fluids. f. When an appropriate blood volume has been collected, good haemostasis is ensured with the use of dry, sterile gauze pad, surgical glue, or silver nitrate. a. Blood samples are allowed to clot at room temperature for at least 30 min. b. Serum is separated from blood cells using a table top centrifuge at a speed of 14,000 rpm for 5 min. c. The serum layer is pipetted carefully without disturbing the packed blood cell layer below and then transferred into a new pre-labeled tube and stored at -20°C until ready to be assayed. d. The frozen serum is completely thawed before testing for ALT, AST, and BUN using standard enzymatic procedures by the UNC Animal Clinical Chemistry Core facility. At least 20 µL is needed: 10 µL/test plus 10 µl for the added "dead volume" during a run. e. Quantitative determinations of protein levels of cytochrome P450(CYP)2E1, CYP1A2, catalase, and glutathione transferase Pi (GSTPi) is performed using microsomes isolated from the left liver lobe using the Protein Detector ELISA kit protocol as detailed by the manufacturer. a. Snapped frozen liver samples (above) from the median lobe (see Figure 1 below) is processed for the determination of glutathione. b. Liver samples are homogenized in borax/EDTA (pH 9.3). c. The homogenized liver is then mixed thoroughly with chloroform by vortexing and then centrifuged to separate unwanted precipitates. d. Aliquots are pipetted in duplicate tubes per liver sample and labeled, one for reduced glutathione and the other for total glutathione assay. e. Glutathione calibration standards and quality control samples are similarly prepared. f. Reduced glutathione is derivatized from liver samples, calibration standards, and quality control samples using SBD-F, while total glutathione is derivatized with TBP in acetonitrile. g. Derivatized calibration standards, quality control, and liver samples are then analyzed by HPLC with fluorescence detection. h. Two calibration curves are constructed (one for reduced and one for total glutathione) to relate the reduced glutathione concentration to its chromatographic response. i. Concentrations are calculated using the glutathione response, sample weights, and a regression line that is constructed from the concentrations and peak responses of the appropriate calibration standards. Figure 1. An illustration of the liver lobes and their orientation within the abdominal cavity viewed ventro-dorsally. a. After collecting blood samples from the vena cava, the livers are quickly excised and sections of the left lobes are placed in 10% phosphate buffered formalin for histopathology and immunohistochemical analyses. 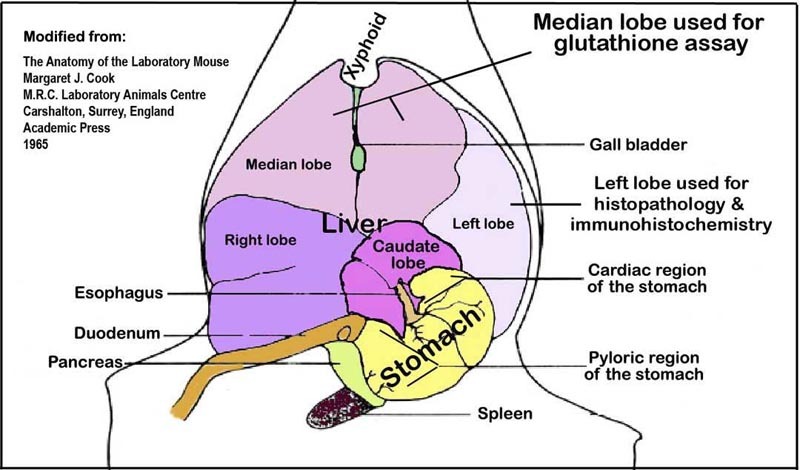 The median lobe and the rest of the liver lobes are snap-frozen in liquid nitrogen and stored at -80°C for glutathione (GSH and GSSG) assay. b. 10% phosphate buffered formalin-fixed liver specimens are embedded in paraffin wax and then cut to a thickness of 5 µm sections and applied to a slide in duplicate. c. The sections are then stained with hematoxylin and eosin (H&E). d. Each slide or histopathology sample is scored blindly for liver injury. 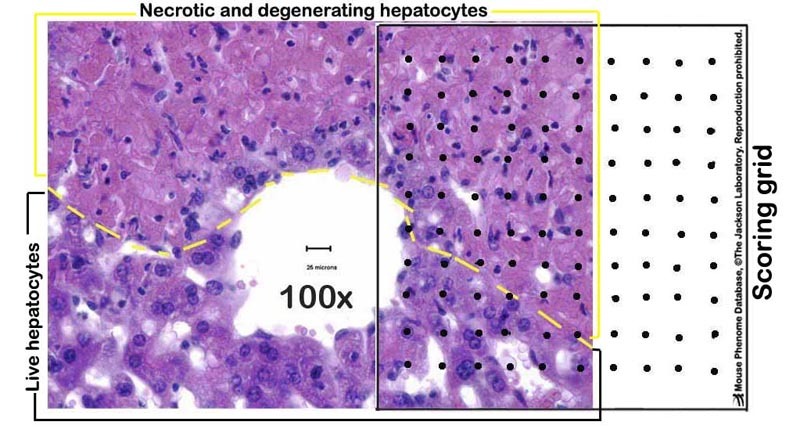 e. Liver necrosis are scored by a point counting technique, where a grid with 100 evenly spaced points is overlaid on printed images of liver sections taken at 100X magnification (see Figure 2 below). f. A veterinary pathologist independently verified the liver necrosis scores. Figure 2. A photomicrograph example of a partially necrotic liver-partly overlayed with a scoring grid. Mouse weight at gavage, body weight at sacrifice, liver weight, liver necrosis score, blood serum ALT (4h, 12h, 24h), AST (24h), BUN (24h), total GSH (GSH + GSSG) concentration, reduced GSH concentration, oxidized GSH (GSSG) concentration under increasing APAP dose (30, 100, 200, 300, 600, 900, and 1200 mg/kg body weight) administered primarily per os., but some given i.p..
Liver catalase, glutathione transferase Pi, cytochrome P450 isoforms 1A2 and 2E1 enzymes via ELISA. Note: Strains (CAST/EiJ, AKR/J and LP/J) tested at higher doses of APAP generally showed resistance to liver toxicity. Likewise, strains (B6C3F1/J, C3H/HeJ, CBA/J, C57BL/10J, and DBA/2J0) prone to hepatotoxicity were tested at the lowest dose of APAP.